Love the flavor and effectivness. I can undoubtedly say these work as advertised, I'm a diabetic that wears an insulin pump with continuous glucose monitoring so I can actually see the results. I like to do longer rides and like most of us I don't want to stop to refuel if I can do it on the road, these really do provide fairly long lasting energy for such a small volume. I'm 220 lbs so later in long rides I'll eat the whole package if my glycogen stores are gone. The watermelon and strawberry flavors are really good, definitely look forward to eating these on my rides. I like this product, this particular flavor has sort of a mouthwatering effect and they have changed to the packaging more like Clif Shot Blocks, much better than any other packaging. Great flavor and replenishes those electrolytes! Careful opening them up, as I dropped two of those blocks the other day ripping into the pack like an ape! Love the small blocks. Enjoy the great taste! 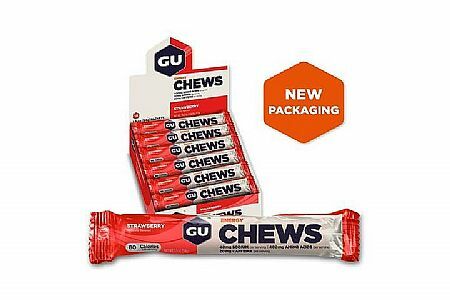 GU chews are an excellent mid-ride source of nutrition as they taste good and are easy to digest. The convenient package takes up little space in a jersey pocket.